Could this be the most useful recipe ever? These flatbreads certainly have the power to transform and are quite delicious. I am not a huge fan of those frisbee like flatbreads or tortillas available in most shops. Flimmy flammy in texture, always rather chewy and disappointing – definitely the single reason I never buy filled wraps. If you are lucky enough to live near a Middle Eastern shop you will probably be able to lay your hands on top notch authentic flatbreads which are an absolute treat. Failing that, make these – they are utterly delicious, soft and pliable, completely moreish – perfect to step in when you may need a pita, wrap or bread roll. Fajitas in these flatbreads are sensational, try Camp Fajitas, (July 2016) or the Lamb Meatballs (October 2012). Wrap one around a sausage with slow cooked onions or Firecracker Red Cabbage (November 2013) for a Bonfire night treat. If I want to serve these alongside a curry, say the Prawn Curry (November 2012) I will add a scattering of nigella/black onion seeds when rolling out for that naan bread vibe. Use them to dip into hummus or any other dips, Cannellini Bean, Parsley and Lemon dip, (April 2015) or with leftover chilli to fashion an unconventional burrito. If serving them simply torn to go with a stew or dips then roll in whatever you like, finely chopped rosemary or thyme, a sprinkle of oregano, chilli flakes or cumin seeds…. Customise them at your will. 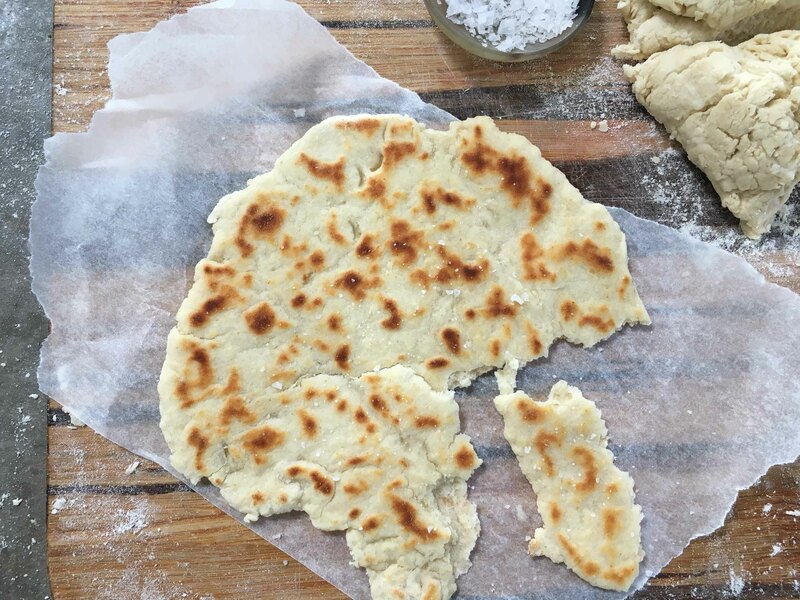 I have tried many, many different recipes for flatbreads and still love those made with a yeast risen dough but these are the ones to turn to in a hurry. 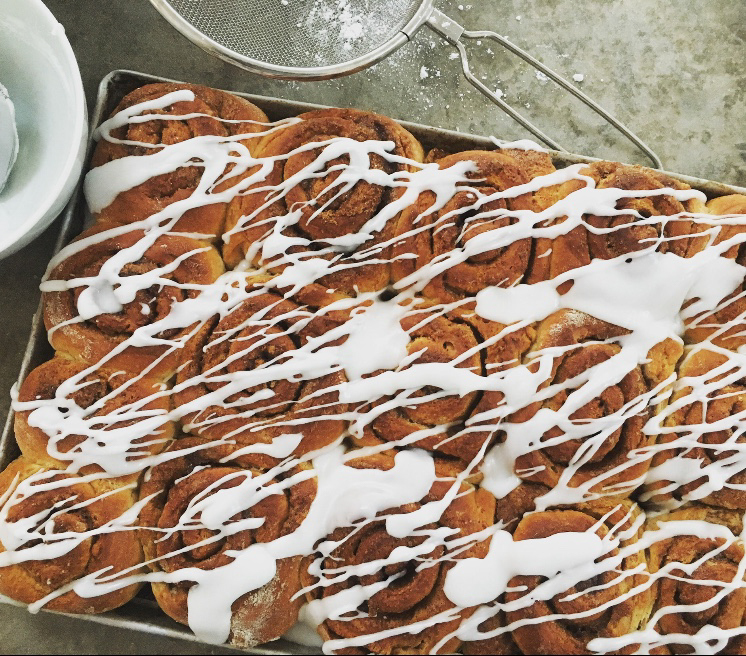 I always have yogurt in the fridge and flour in the cupboard – these are super quick, just the mixing of a few ingredients, rolling out and cooking in a hot pan. Life changing. As you can imagine these are at their best when just cooked – this shouldn’t be a problem as they are so good they often don’t make it to the table in our house. If you want to make ahead I recommend you mix the dough whenever it suits and then wrap in clingfilm until you are ready to cook the flatbreads. I often put the dough together in the morning when I have 5 spare minutes ready to whip up the flatbreads later in the day but it will happily sit in the fridge for day if that suits you better. I’ve used most kinds of yogurt and they all work, earlier this week I used a mix of both Greek and natural because I wanted to finish one pot before I opened the other and the flatbreads were perfect. You may need a drop more yogurt or a sprinkle more flour sometimes as flours can behave differently but 200/200 is usually right. I can’t recommend them highly enough! 200g yogurt, any kind will do, I’ve used both Greek and regular natural yogurt or even a mix (see introduction). Mix the flour, salt, baking powder, oil and yogurt to a dough. Form into a ball, flatten and divide into 6 (or 4 if you want larger flatbreads). Roll these out on a floured surface until the size of a side plate (now is the time to add any flavourings such as nigella seeds – see introduction). Heat a frying pan over a medium heat, brush one side of the flatbread and put it oiled side down in the pan, cook for a few minutes until turning golden then brush the uppermost side with oil and turn to cook that side. This whole process with take a matter of minutes. Repeat with the remaining dough. Sprinkle with a little salt when warm but I warn you this makes them irresistable…. Makes 6. When I lived in London there were several favourite Italian restaurants that I would frequent from time to time. There is something particular about entering such an establishment, the clamour and enthusiasm, the noise and bustle, the smell of herbs and garlic cooking that fills the air. Following the greeting and seating a proper treat awaits you. 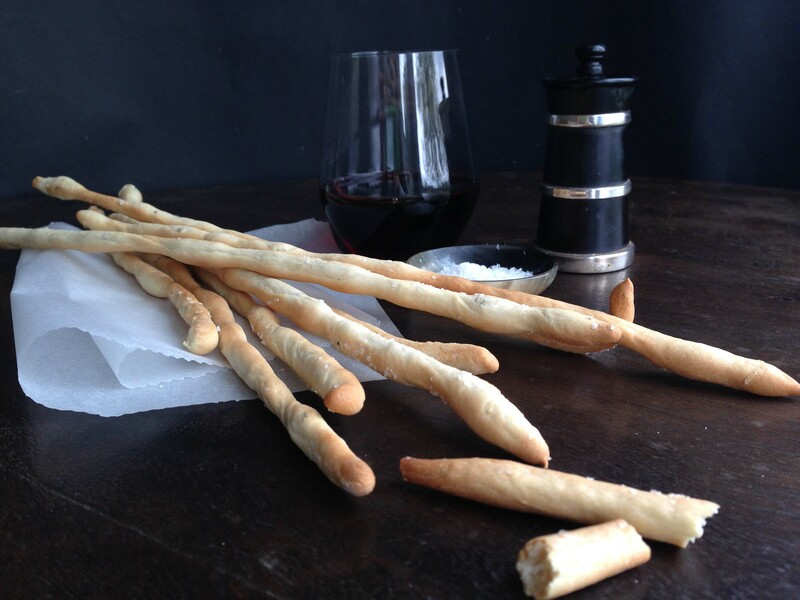 The grissini – slender, crunchy breadsticks all the better for gouging through the butter. Not as filling as the proffered focaccia but the perfect nibble with a glass of wine whilst perusing the menu. I love them and so do my family so we make our own. Now I can’t pretend that dining in my kitchen offers quite the same experience. Different certainly but just as much fun I would hope. 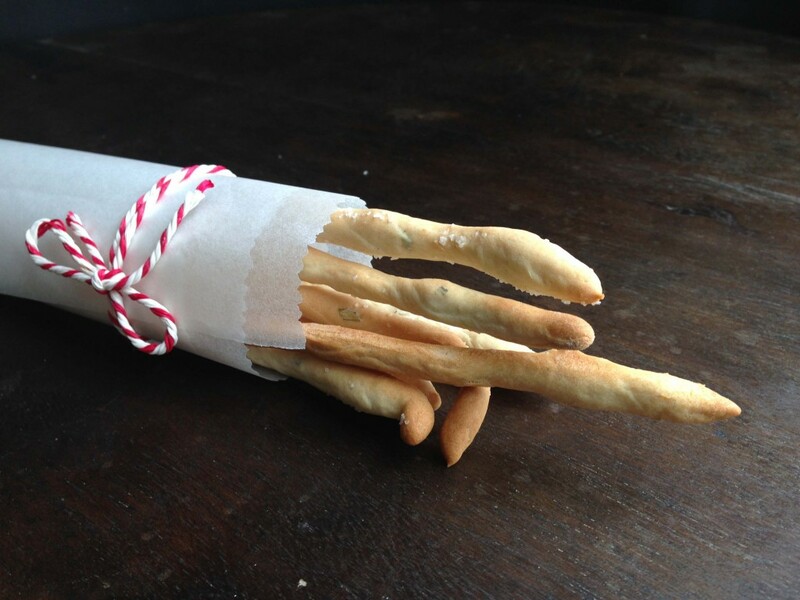 These grissini however are definitely up to those of nostalgic, rose or should that be frascati touched memory. Crispy, savoury and in this case taken to new heights with the addition of chopped rosemary. I serve these before and alongside lunch or dinner, take them on picnics and they are much in demand for packed lunches. Very delicious and moreish to eat and so easy to make. The rolling out takes me back to the days of plasticine and playdoh and is repetitive and relaxing, in a black clad Italian Mama sort of way. Think Sophia Loren…. Children love making these which is always a help and last week, rather than making the traditional stick shapes, my daughter fashioned each dough snake into an initial to place in each diners place at the table. It looked charming and went down a storm. Preheat the oven to 200. Put both the flours, yeast and fine salt into the bowl of a stand mixer, turn it on and then add the water and oil until it comes together in a ball (you may need a drop more water). Leave it kneading away in the machine for 10 minutes, adding the chopped rosemary for the last minute so it is evenly mixed through the dough. Leave for half an hour if you can but they will still work if you are pushed for time. Pinch off pieces the size of a large cherry and roll these out until about a foot long and pencil thin on a non-floured table or surface. Gently and with fingers splayed seems the best way to do this. 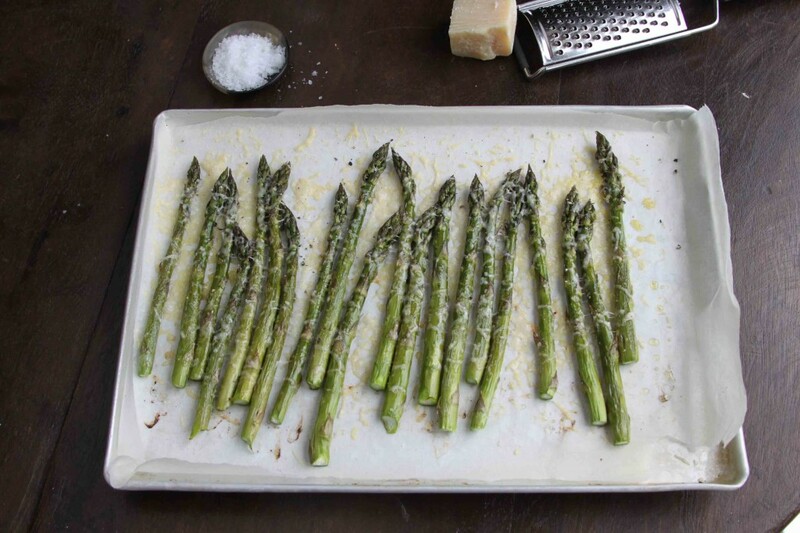 Put them onto a baking sheet lined with parchment, sprinkle with sea salt and bake for 15 minutes. After this time they should be golden brown and crispy, leave to cool on a wire rack and then store in an air tight container. Makes around 40 grissini but if you get bored whilst rolling these out the dough will sit happily in the fridge for a day until you feel like making some more. I’d say they last for a week but I’ve never had any hang around for more than a day or two. Finally, they make a fabulous present to take if you are going to friends for supper. We had a houseful over the weekend with extras for lunch on Sunday and whilst I wanted everyone to be well fed of course, the last thing on the menu was for me to be stuck in the kitchen (hissing) all weekend. With ages ranging from 18 months to grandparents and childrens’ teas to add to the mix I had much to do. Nothing for it but a bit of organisation, a good list and setting Friday morning aside to get ahead. I thought I’d let you know what we ate and what I was able to prepare beforehand in case any of these tips help. Saturday lunch was a picnic with Cannellini Bean, Parsley and Lemon Dip (April 2015) with grissini (recipe coming soon) and Wild Garlic Focaccia (May 2014) alongside a big plate of salami, a bowl of tomatoes and a good chunk of cheddar. For pudding we had meringues with vanilla bean cream and chocolate sauce (recipe coming soon). I made the grissini, focaccia, meringues and dip on Friday so putting lunch together on Saturday only took a few minutes. Incidentally the dough for the focaccia will happily sit in the fridge overnight so it can be baked just before lunch. At tea the children had orzo with bacon and tomato sauce (June 2015). 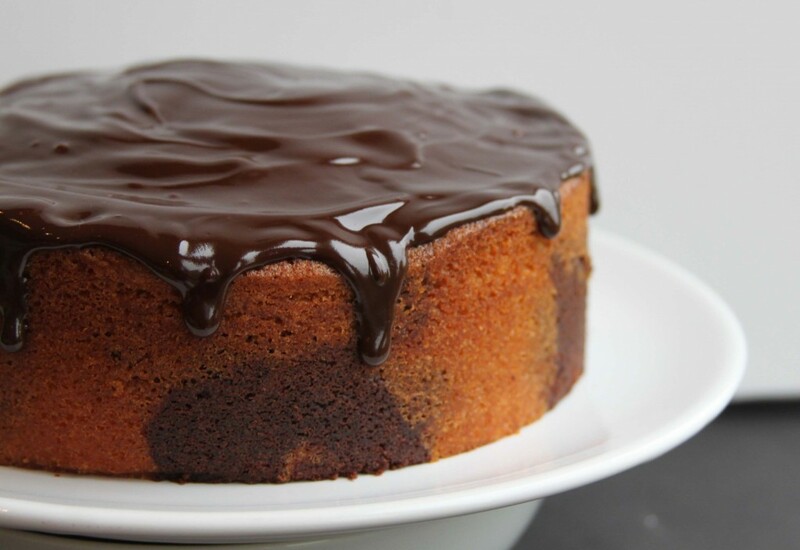 Pudding, and for us to tuck into with a cup of tea, was a Chocolate and Vanilla Marble Cake (October 2013) which I made on Friday. For supper we had Chicken with Harissa (October 2012) with Little Rosemary Roasties (March 2015) and my favourite Green Salad (January 2014) – couldn’t have been easier. On Sunday we had Lamb which had been marinading in garlic, lemon and rosemary. With this Fresh Herb Sauce (July 2013) but I used half mint and half parsley which made a funky full of flavour modern take on old fashioned mint sauce. It went down an absolute treat. We didn’t need much for supper so I roasted several bunches of fabulous in season asparagus (June 2014) followed by Vanilla Pannacotta (July 2014) with poached rhubarb, both of which I made on Friday. At each sitting I was delighted that the children scoffed everything except one who found the colour of the fresh herb sauce too alarmingly green. Admittedly I gave myself quite I lot to do on Friday but I have to tell you it was worth it and it helped to know anything left to prepare was easy and also that so much was already in the fridge or cake tin. Finally please don’t think there is even one iota of smuggery here, I am rarely this organised but have proved to myself this weekend the virtue of planning and preparing ahead. You may always be this organised but if not, I hope some of these tips and recipes might help you breeze through it next time you have a houseful. One more thing, I finished off the leftover poached rhubarb and vanilla bean cream with a last meringue and it was fabulous. It reminded me of a rhubarb pavlova that I made a couple of times last year and I will post that recipe soon. Prior to the big feasts in a week or so, it is a very much a soup time of year. Nothing like a bowl of soup, cosy and warming to keep the chill out. What I really like is something special to go with it to make a proper lunch rather than a simple token something to eat. As I ever, I want a feast. 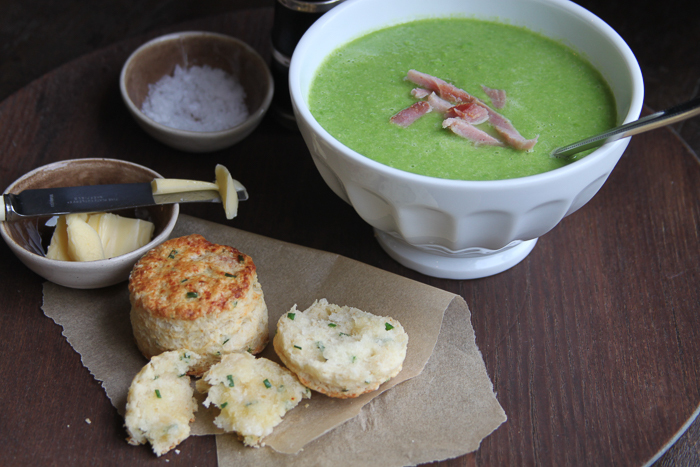 Earlier this year I shared the recipe for some cheese scones which were fabulous with my quick pea soup. This bread is along similar lines but a little more versatile and could well be your star guest over Christmas. Not only is it perfect with soup or any starters, but a warm loaf of this presented alongside cold turkey or ham will turn leftovers into something properly special. 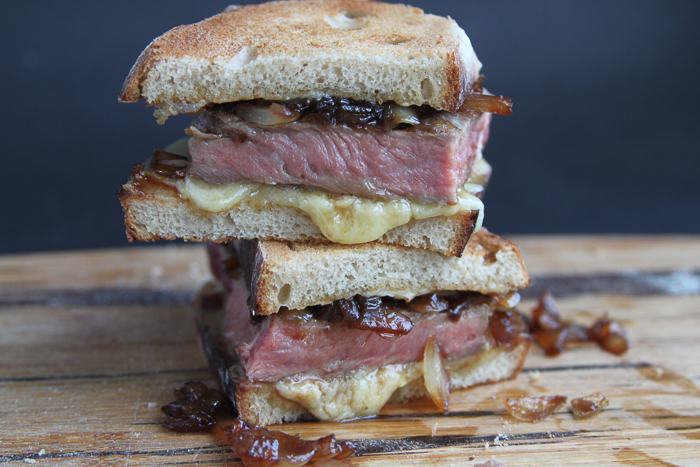 I made this with the last of my Barber’s 1833 Vintage Reserve Cheddar which you may have seen feature in a couple of recipes recently – a knockout steak, cheese and sweet onion relish toastie and butternut stuffed with leeks and cheese. In both cases this super tangy, full flavoured cheddar was king which, considering Barbers have been making this cheese since 1833 is unsurprising. To get to the point, they have really got the hang of it and their cheese is fantastic. I make this bread with my regular white loaf recipe and if you omit the cheese and chives that is exactly what you will have, a good everyday loaf should you need one. If you have some blue cheese hanging around over Christmas then use this instead for your bread with some chopped rosemary in place of the chives – it is a sensational combination. I usually use this amount to make two loaves, one cheddar and chive and the other gorgonzola and rosemary. The 125g cheese is enough for one loaf, simply double that and the chives if you are making both loaves cheddar and chive. You could of course leave the second loaf plain and have it for breakfast. 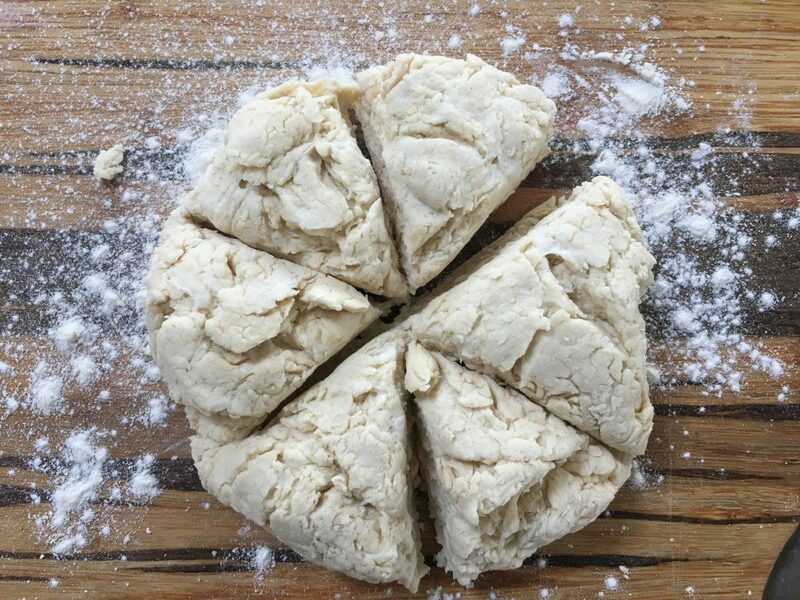 Mix the flour, salt, yeast, butter and water into a dough and knead for 10 minutes either by hand or with a stand mixer. Cover with a tea towel and leave to rise somewhere warm for at least an hour or until doubled in size. 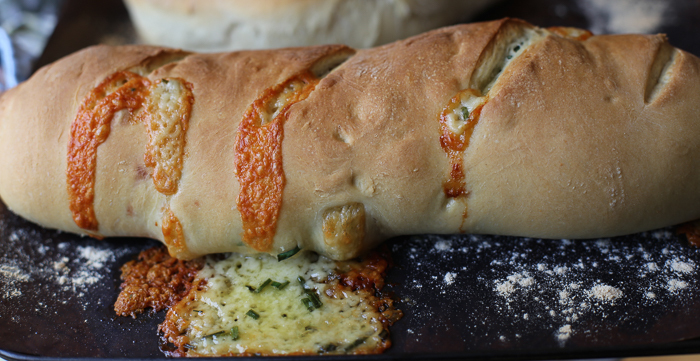 Split the dough in two and roll each out into a rough A4 rectangle, scatter over the cheese and chives and roll up into a log shape squidging the cheese into the dough as you go. If you are leaving one of the loaves plain just form it into whatever shape loaf you like. Place these onto a lined and floured tin, cover with a tea towel and leave for a further hour. Preheat the oven to 200. Slash the top of the loaves a couple of times if you like and then bake for 20 minutes until golden brown, some of the cheese may leak out but that is part of the charm and those bits will be delicious for whomever gets to them first…. When it comes to cheese, Cheddar is King. I feel some intakes of breath and raised eyebrows so let me explain. I love cheese, absolutely adore the stuff. Blue cheese, soft cheese, smelly cheese, holey cheese, hard cheese – you name it, it works for me. If however and God forbid, I had to choose just one cheese then it would have to be cheddar and this is why. Parmesan is fabulous – strong, salty and perfect grated on pasta, shaved over salads or in chunks after dinner with a perfect pear – but I don’t want it in a cheese and pickle sandwich. Gorgonzola in a warm salad with mushrooms or melted over my onion tart tatin is splendid but I wouldn’t want it in my cauliflower cheese. Sharp white feta – just the ticket in a Greek salad or my Feta and Spinach parcels but honestly has no place in a wobbly, fluffy cheese souffle. Do you see where I am going with this? All cheeses have their perfect place, some can even adapt to a couple of occasions but there is only one contender for the main prize, one that can do everything, the supreme all rounder – the mighty cheddar. Sweet, tangy, nutty, salty it is just divine and a regular in my fridge. In fact since I first set out into the big wide world and had to fend for myself I don’t think my shopping basket has ever been without it. First few weeks in London – cheese on toast with Worcester sauce to remind me of Yorkshire Saturdays in front of the wrestling. Studying for my city exams – cheese and pickle sandwiches for a week so as to have no cooking distraction. Oh and when I say cheese in both these cases I do of course mean cheddar. It is a saviour when I need to rustle up a packed lunch from a skeleton fridge or for a snack and I’m sure barely a week goes by without it being the main feature – cheese souffle, cauliflower cheese, Welsh rarebit, cheesy leeks on toast, a grand Saturday ploughmans or my daughters favourite, plain pasta with butter and cheese. This then, is a new best friend. A love child if you will from a grilled cheese sandwich and a steak sarnie. The melty cheddar forms an alliance between the savoury, meaty juices and the sweet onion relish that has to be tasted to be believed. That it is all incased in toasty, crisp bread is simply gilding the lily. It is superb, it is supreme. Just try it. You might want to add a handful of rocket or watercress to the sandwich for a little peppery bite, not that it needs it but you might like the greenery. Melt the butter and oil in a small frying pan, add the onion and a pinch of salt and cook slowly until soft, about 15 minutes. Stir in the sugar, balsamic and a teaspoon of water and cook for another 15 minutes by which time you should have a sticky relish, taste it as you may need a drop or two more of balsamic. Cook your steak how you like but rare to medium rare works best for this, then sprinkle with salt and leave to rest for at least 5 minutes. Whilst it is resting preheat your grill to high, toast the bread and then divide the cheese between the two slices of toast and put under the grill until the cheese is melting. 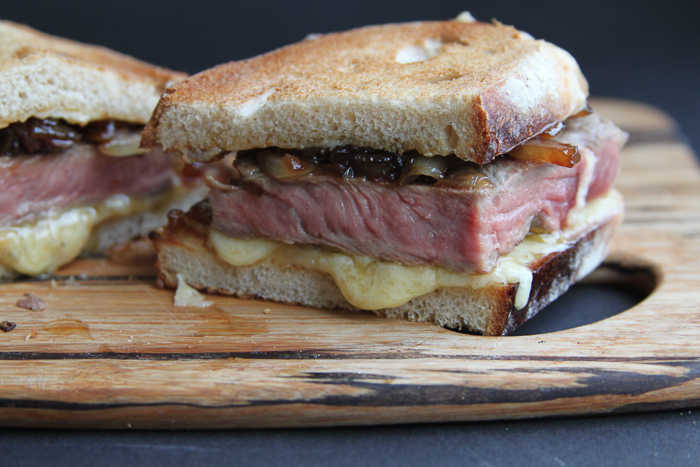 Place your rested steak onto one slice of cheesy toast, spread over the onion relish and top with the remaining slice. Cut in half and tuck in. I recently attended the BBC Good Food Fair as a guest of Barbers1833 who kindly gave me some of their delicious cheddar which I used for this and several other recipes. I was already a fan of their cheddar and regularly buy it from my local farmshop. 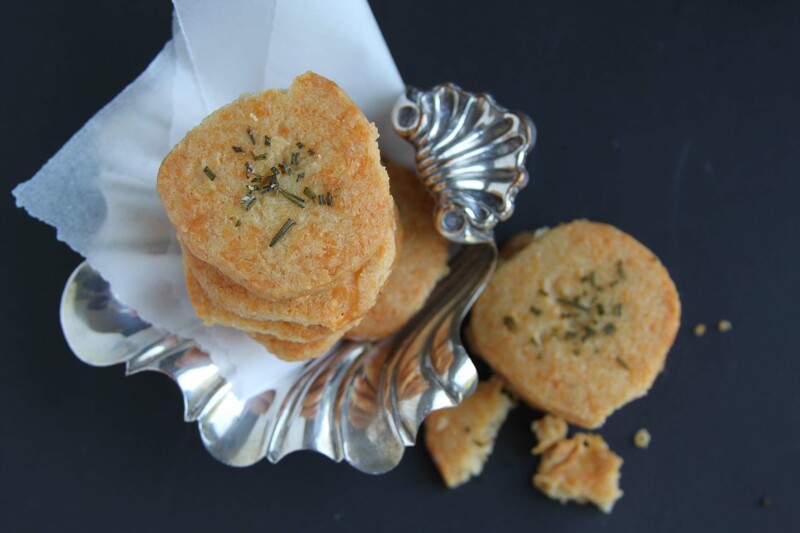 By the way, I have previously made my Cheese Sables with Rosemary Salt (December 2013) which rely on a belting cheddar, with Barbers1833 and they were amazing. I love a bit of thrift, nothing more satisfying than using up bits and pieces that might otherwise find their way into the bin. So it was with my pea soup here. We had a baked ham for supper and whilst there wasn’t enough to make another supper for four there was a small chunk left plus the water I cooked it in. I always intend to use this liquor for some useful purpose but must confess it often sits in the pan on the back of the hob until it has to be thrown away. Today I was determined however and with the addition of a bag of frozen peas and a couple of spring onions sautéed in butter it has made a delicious soup, just the warming ticket for a breezy day. You could add a swirl of cream, something I rarely turn down with soup, but here I’ve used a few little bits of the leftover ham. Wanting to jazz this frugal lunch up a bit, but not wanting to go shopping I decided to make some scones. There is always flour and cheese around and I happened to have bought some buttermilk the other day to make a cake with. I split my usual scone recipe between cheese and chive to go with the soup and the other half sweet, sugar topped ones to greet the children with when they get back from school this afternoon. The left over cheese scones will be filled with the last of the ham for their packed lunches tomorrow. I hope this doesn’t sound hideously smug but – hurrah, everything used up and stretched further than I had anticipated. Good stuff. This is barely a recipe however, I sautéed two chopped spring onions in a teaspoonful of butter until soft then added a 400g bag of frozen peas. I added a litre of the leftover ham poaching liquor and heated until the peas were just cooked. Whizzed with a hand held blender until smooth and served with some chopped ham. 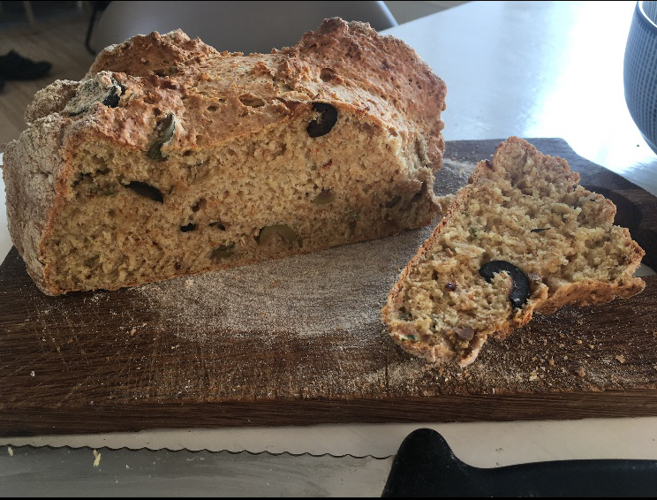 I often have a carton of buttermilk in the fridge, it has a great shelf life and works a treat in many bakes or, of course, soda bread (Seedy Soda Bread, April 2013). The recipe that follows is my usual (sweet) scone one. As mentioned I split the recipe and added 60g of grated strong cheddar and a small bunch of chopped chives to one half. To the other I added 40g golden caster sugar. Both I brushed with milk before baking and sprinkled a little more sugar over the sweet ones. Preheat the oven to 200. Sift the flour and salt together and rub the butter into it until it resembles fine breadcrumbs. Then add the sugar and buttermilk and mix together until it just holds as a dough but don’t handle it more than you have to. Form into a round and pat or roll out until about one inch thick. Cut out and put onto a floured baking sheet, brush with milk if you want and scatter over a little extra sugar. Bake for 12-15 minutes until golden and well risen. 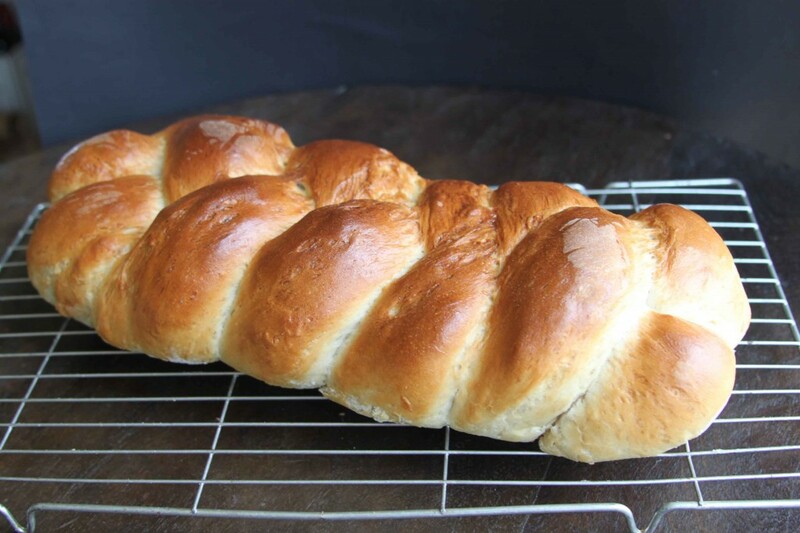 When I was a child we would often go to Kings Bakery in Ripon on a Saturday to buy a plaited milk loaf – it was my favourite bread and I loved going to this bakery with its in-one-door, out-the-other door shop. 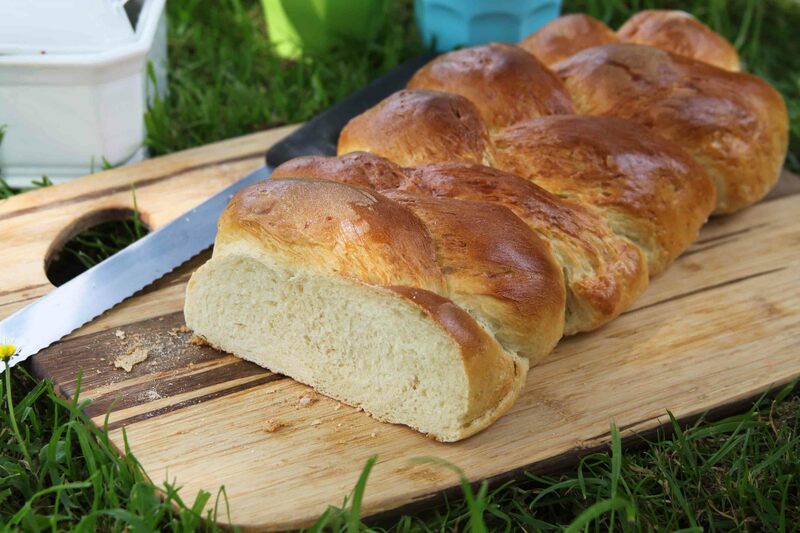 The loaves were plaited beautifully, far better than I can ever achieve and tasted heavenly. A slice on its own was delicious enough but spread with good butter thick enough to see your teeth marks in, aah I can still remember the taste. Milk loaf is not as rich as brioche but is a step up from an ordinary white loaf and so whilst good for everyday still has a whisper of treat about it. As this loaf was cooling from the oven I did the school run, on our return my children and I went into the garden and ate slice after slice with butter in the dappled sun, proper Famous Five stuff. Please don’t think it a faff to do, bread is super easy to make and so rewarding, the only consideration is time. If you want a loaf for lunch make it in the morning, want it for tea then make it right after lunch. Once you have made the dough there are two risings of about an hour each and then baking for around 30 minutes so you are looking at around a total of 3 hours. Panic not though, for most of that time the dough looks after itself whilst you do something else. I love a good wholemeal loaf or chewy sourdough, they all have their place in my kitchen but I think the white loaf has fallen from fashion and been somewhat maligned, avoided. This is the loaf to bring it back into the fold, fabulous as is and it makes superb toast too. Have a go at making this, your family will love you for it and probably love making it with you too. I have some 10 to 12 year old girls coming over on Saturday for a cooking class and I though this loaf the perfect place to start. What a treat to take home at the end of the morning and it gives us time to make plenty of other goodies during the rising times. Warm the milk with the butter until just tepid and the butter melted. Put the flour, yeast salt and sugar into a large bowl or the bowl of a freestanding mixer. Add the milk, mix well and then knead for 8-10 minutes until smooth and springy. Dust the inside of the bowl with some flour, put the ball of dough back in, cover with a tea towel and leave somewhere warm for 1 hour or so when it should be doubled in size. Then knock the air out of it, knead briefly again and then divide into three and roll these three balls into sausages. Squidge one set of ends together and plait the loaf then squidge the other ends together. Put onto a baking tray which you have dusted with flour, cover again and leave for another hour. Before this second hour is up preheat your oven to 200. Brush with milk and then bake for 25-35 until golden and the loaf sounds hollow when you tap the bottom. It is that time of year again and the familiar whiff of wild garlic is in the air. This feels like the beginning of a slew of seasonal goodies and I look forward to it every Spring. 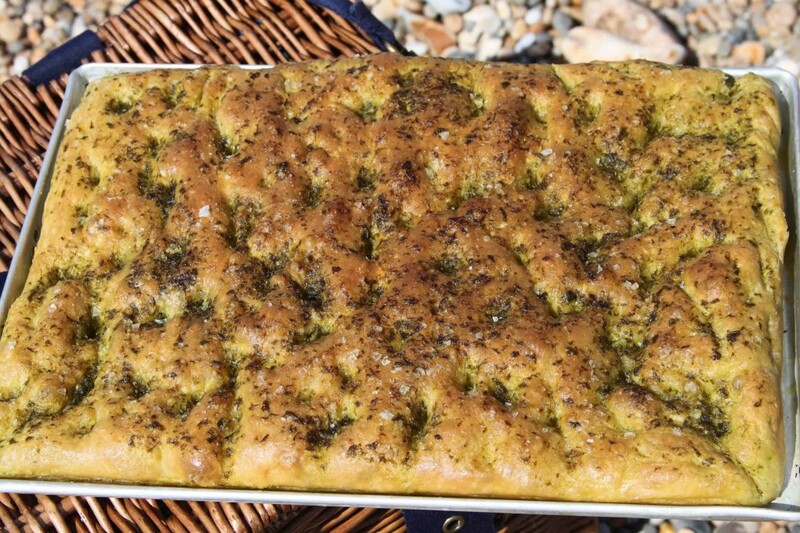 As soon as I picked a bunch of wild garlic yesterday I knew I wanted to make a focaccia with it and whizzing the leaves into the oil seemed the best way to get the herbaceous notes into the bread. I made the dough yesterday evening and let it rise overnight so I only had to knock it back and put it in the tin for a final rise this morning – couldn’t have been easier. You could of course make it all in one day but this suited me better for brunch on the beach with friends. 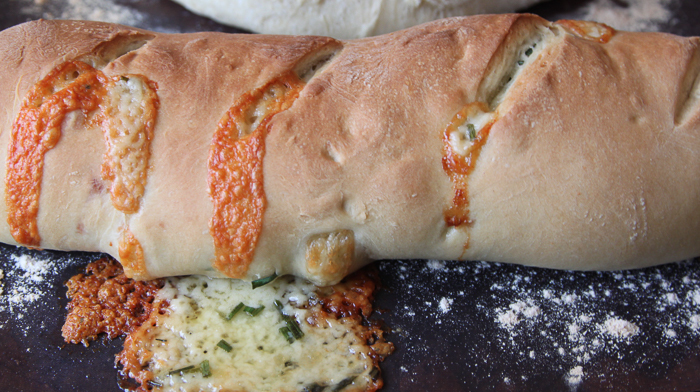 This makes a fabulous, squidgy loaf perfect for lunch or with a picnic as we had it today. I took it from the oven to the car and it was still warm when we ate it. Dip into oil and balsamic or use it to make a stella sandwich, stuffed with whichever goodies you like. 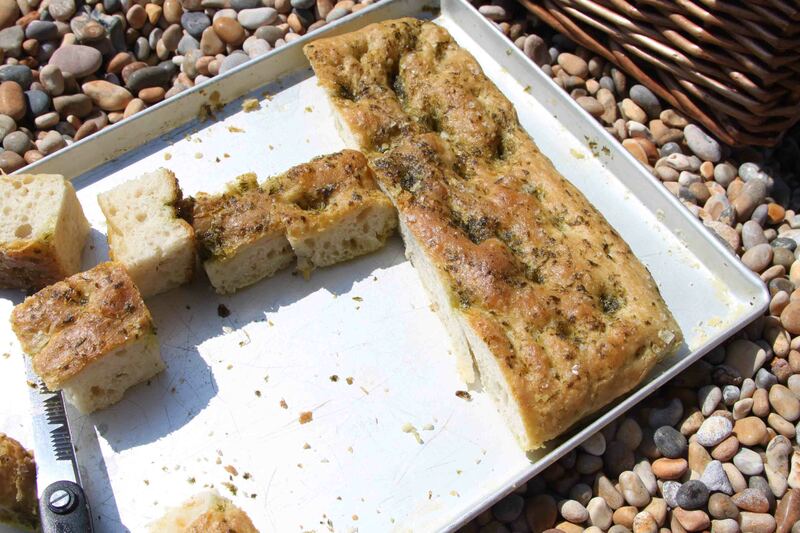 We had ours cut into little squares which the children loved, a sort of herby garlic bread. My husband had his cut in half horizontally with a fried egg cooked on the fire on the beach, perfect. For other ways to use your wild garlic check out the pesto (May 2013) which I wrote about last year or how about strewing some chopped leaves over a salami topped pizza…. Mix the flour with the yeast, salt, water and 50ml of oil and knead for 5 minutes. Leave in a warm place for 1-2 hours until doubled in size or put in the fridge overnight. Preheat the oven to 190, knock the air out of the dough and then press it into a shallow tin approximately 24x34cm. Cover loosely and leave to rise for 30 minutes. Meanwhile whizz the garlic and 75ml of oil with a hand blender, or similar, until you get a fabulous green oil. Press your fingers into the dough to make dimples and then pour the oil over to fill the little holes and cover the entire surface. Sprinkle generously with sea salt and bake for 25-35 minutes until golden. Check the bottom is brown, you can always give it another 5 minutes directly on the rack if necessary.